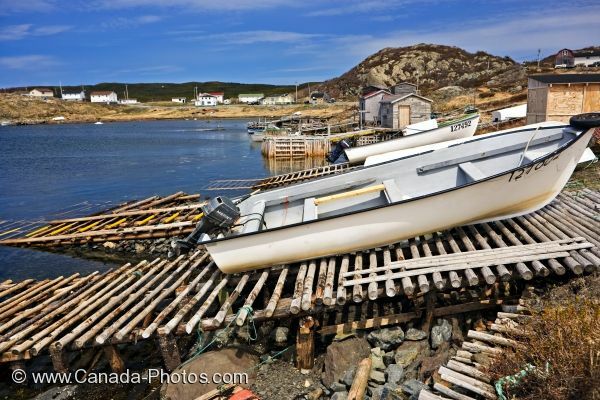 Wooden boat ramps line the harbour of St. Lunaire-Griquet in Newfoundland, Canada so that fisherman can pull their boats out of the salty water. Fishing is part of the livelihood in the town of St Lunaire-Griquet in Newfoundland, Canada and pulling the boats up onto the wooden boat ramps makes it easier for launching every day. The harbour of this unique Newfoundland town is a lovely spot to sit and enjoy the scenery and watch the fishing boats being hauled out onto the boat ramps. Boats hauled out on wooden ramps in St Lunaire-Griquet Harbour, St Lunaire-Griquet, Viking Trail, Highway 436 enroute to L'Anse aux Meadows, Great Northern Peninsula, Northern Peninsula, Newfoundland, Canada. Picture of fishing boats atop the wooden boat ramps in the harbour of St. Lunaire Griquet in Newfoundland, Canada.